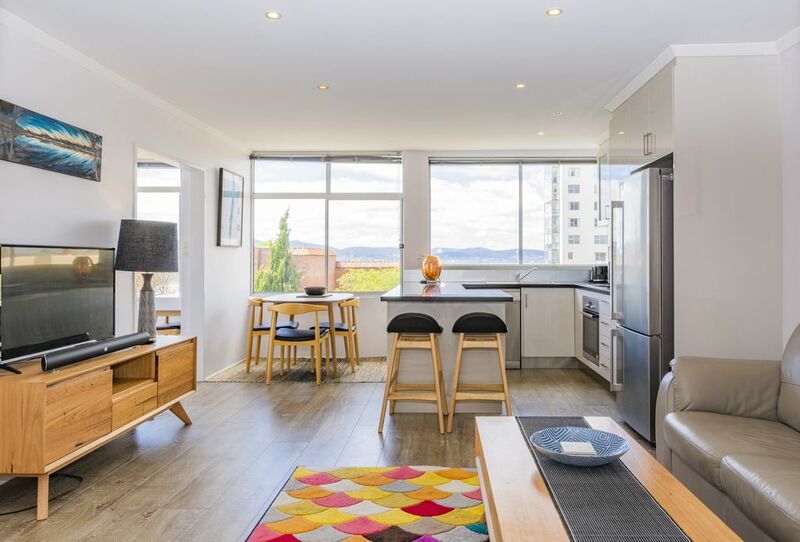 Great views in an unbeatable location - only a 2 minute walk to Salamanca - Hobart's vibrant cultural precinct, a 5 minute walk to the renowned cafes and restaurants of Hampden Road, and a 10-15 minute walk to the waterfront and city centre. The perfect place to base yourself whether visiting for leisure or business. Secure undercover parking for small to medium size vehicles. THE SPACE - One bedroom apartment located on the third floor up two flights of stairs (no lift) with open plan living, dining, kitchen and study/sunroom. Modern furnishings with all the comforts of home. Unlimited broadband internet access. PARKING - Secure parking available in lock up garage for standard vehicles (height restriction due to roller door, large 4WD or vehicle with luggage on roof racks not acceptable). Note a $100 replacement fee will be charged if the remote key for the roller door is not returned. Free parking is also available on the street. A 2-hour limit applies 8am-6pm Monday to Friday and 9am-3pm Saturdays. LIVING AREA - 3 seater leather couch,Tasmanian oak coffee table and entertainment unit, smart TV with Netflix, JBL Soundbar with Bluetooth for playing your own music. KITCHEN - Quality appliances, utensils and tableware. Basic cooking supplies are provided such as oil, herbs and spices, as well as coffee, and a selection of teas. Cereal and milk for a few days also provided for quick breakfasts. DINING - 4 seater table right at the window with great views. SITTING AREA - desk with basic stationary, double sofa bad with air filled core (extremely comfortable) that can be made up for extra guests prior to check in. BEDROOM - Spacious built in mirrored wardrobe, marble top bedside tables with reading lamps, luxurious warm queen bed with professionally laundered linen. BATHROOM -walk in shower, vanity unit, heated towel rail, Miele combination washer/dryer, toiletries provided (Milk & Co shampoo, conditioner, body lotion, body wash, soap, shower cap plus shaving and dental kits for when you forget to bring your own). Note - bathroom is only accessible through the bedroom. FOR 2 GUESTS WANTING SEPARATE BEDS - If you would like the sofa bed made up and staying with only 2 guests your booking will be amended by an additional $30 per stay. HEATING / COOLING - For those warm days (very few in Hobart!) there is ample cool air flow by opening windows or using the oscillating fan. On those chilly days there are two panel heaters available and extra blankets. There is no heat pump / air conditioning. FAMILIES - While we welcome families there are limited facilities for toddlers and infants. A booster seat that straps to a chair is available for feeding. A portacot / travel cot with a bassinet and change table is also available. GETTING AROUND - Just about all you need is within walking distance. if you're travelling further afield the bus interchange is a 15 minute walk. The apartment is a 25 minute drive from the Hobart Airport. The airport shuttle stops 100m from the apartment at the intersection of Battery Square and Runnymede Street (opposite the Lenna Hotel). BATTERY POINT - Hobart's village feel prime residential area characterised by historic buildings. The popular Jackman & McCross Bakery make a mean coffee and is less than a 5 minute walk; as well as the infamous Da Angelos Italian restaurant, Thai and Indian options too. florist, hairdresser and boutique homewares stores. Great to just stroll around the village enjoying the architecture and coastal views. SALAMANCA - The historic, creative and cultural hub of Hobart is a short 2 minute walk away featuring top cafes, restaurants, bars, Saturday markets, art studios, a theatre, supermarket and a wide range of stores. HOBART WATERFRONT - adjacent to Salamanca - more top restaurants and bars, home to world-class festivals and events such as Dark Mofo, Taste of Tasmania, Sydney to Hobart Yacht Race, Festival of Voices, Wooden Boat Festival. Also launching point for ferries to a range is destinations including MONA. We have been travelling to Hobart for years but we found this property to be the most convenient and well set property we have ever stayed in. The host, Carol, was an absolute delight to deal with. Carol our host, thought of everything. AND even spare shaving kits! We spent 4 nights. Could have made it a week. The hood had wonderful restaurants in EASY walking distance. Hobart is a cool town. Great view,brilliant position,short walk to shopping & restaurants. Easy access into and out of the city. Carol's property was just what we needed for a winter get away in Hobart. The kitchen is really well equipped, with sharp knives, all the supplies you'll need and a really good selection of tea/coffee/milk/oil/cereals. The apartment is comfortable and cosy and has a lovely view down to the water. And the location is superb. We easily walked to Salamanca markets, Battery Point, Sandy Bay. Yet, we were out of the city in 15 mins. We'd love to stay again. We loved our stay here the apartment was so clean and location was amazing. We will definately be telling our friends about this little gem. The kitchen made preparing meals to save some dollars easy as well as its properly stocked and clean.